I saw my first major-league ball game in 1948, at Wrigley Field in Chicago. I was a few months short of my seventh birthday, and I can remember where I sat with my parents and how the game turned out as if it were yesterday. I had been watching Cubs’ games on TV for several months (we had the only TV set on our street in Winnetka, IL), and suddenly the black-on-white images from a 10-inch Dumont screen were being supplanted by a green playing field and ivy-covered walls in the outfield. Sheer magic. I had never been to a major-league ballpark, so I didn’t realize how quirky Wrigley Field was. It wasn’t just the ivy on the walls. Pat Piper, the public-address announcer, sat on the field behind home plate. He never used the word “number” when introducing a player. It was, “Attention, attention please. For the Cubs, forty-eight, Andy Pafko.” Piper spoke with a flat Midwestern accent; he pronounced Gene Mauch’s name “Mock” instead of “Mawk.” In stark contrast to most public address announcers today, Piper never used verbal flourishes to excite fans about a hometown player; he wouldn’t have been caught dead screaming, “AANN-DEE PAAF-KOH!” in a dramatic crescendo. Piper’s unchanging staccato delivery was enough to remind the fans where they were. And back then, a player’s accomplishments, not cheerleading from the P-A announcer, determined his popularity. The Cubs had won a pennant three years earlier, but that fact was never mentioned on any broadcast that I recall. Each game, like each season, existed in a kind of time capsule. No public-relations effort was made to portray the Cubs as a team worth watching, in another striking contrast to the present era of hyperbole, where baseball is an extension of Corporate America. Beloved Cub players of the preceding generation like Stan Hack and Gabby Hartnett had recently retired, but to learn about them a young fan had to consult the Reach Baseball Guide, a soft-covered handbook that provided details about prior seasons, including box scores of World Series and All-Star games and batting averages for every big-leaguer. I devoured it. Former Cub stars were never introduced at the ballpark; at least they were never seen on television. Charlie Grimm was the team’s manager, but viewers were never told he had once been a star player. At the time, I couldn’t have cared less about any of the following: where the Cubs stood in the standings (at the bottom, by 1948), whether the game I was seeing had any bearing on the pennant race, what a pennant race was, what kind of salaries the players made, and whether they were men of good character or not. I didn’t even care that day about being seen on television by my playmates, or catching a foul ball, or eating peanuts. My fervent wish, my only wish, was that Andy Pafko would hit a home run. He didn’t. Nobody else on the Cubs did, either. Jeff Heath, an outfielder with the Boston Braves, hit the only home run in the game; it came in the ninth inning, inside the park with two men on base, and it converted a 4-2 Cubs’ lead into a 5-4 victory for the Braves. I can remember Hal Jeffcoat, the Cubs’ centerfielder, crashing into the ivy in a vain effort to catch the drive, knocking himself unconscious in the process. I can remember Bill Nicholson, the Cubs’ heavy-set rightfielder, lumbering over to retrieve the ball, which labored effort gave Heath ample time to circle the bases. My first big-league game turned out to be microcosmic of the Cubs’ season, and of most of their seasons since. Sheer frustration. But I didn’t care. I really didn’t. I had seen Andy Pafko in the flesh, that familiar #48 decorating the back of his white home uniform, and I just knew he’d hit a home run the next time I went to Wrigley Field. I just knew it. The next year my indoctrination into baseball expanded. My dad took me to Comiskey Park to see the White Sox play the Red Sox. Someone had given me a Boston cap to wear, and I had posed for a photo while pretending to be Ted Williams, whom I had seen on TV once or twice and had read about in the baseball guide that had become my bible. I loved to bat left-handed, albeit my parents tried to make me do everything right-handed, and Williams was batted lefty, of course. I worshipped him almost as much as I did Andy Pafko, and when Teddy Ballgame hit two home runs that day at Comiskey, he momentarily replaced Handy Andy in my boyish affections. For the record, the Red Sox won the game, 7-2. In case anyone wonders how I could remember such a detail after 60 years, be assured that true baseball addicts can do that sort of thing easily. In 1987 I first met Red Sox legend Johnny Pesky at a fantasy camp, and told him about my first “Ted Williams sighting” and how The Splendid Splinter had hit two homers at Comiskey Park one fine day back in 1949. Pesky (a dyed-in-the-wool baseball man who is still associated with the Red Sox) replied without hesitating, “I remember that game. I played third base that day.” (He was normally a shortstop). As with my first game the year before, the Red Sox’ victory existed in a personal time capsule; I was blissfully unaware that the Red Sox and Yankees were then fighting for a pennant. I had never heard about their bitter rivalry or the so-called “Curse of the Bambino”; I knew nothing of Ted Williams’ private life and his battles with Boston sportswriters, and never dreamed then that 41 years later I’d be wearing a Red Sox jersey and sitting in a dugout alongside Williams, or that I’d be getting hits off former Red Sox pitchers Luis Tiant and Lee Stange (while batting left-handed) in a fantasy camp game. 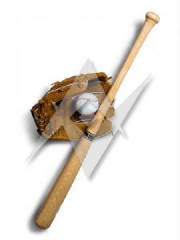 But as early as age seven, I was pretending I could hit major league pitching. On TV it didn’t look that hard. It just took me four decades to prove to myself that I actually could. Baseball for a seven-year old boy in 1949 was its own reward. I played in the vacant lots near my home with neighborhood kids, hit a lot of home runs (of course, a ground ball that rolled forever became a home run, because our fields had no fences), struck out a lot, and followed the Cubs faithfully on TV. They also struck out a lot, but that was O.K. One home run made up for ten strikeouts, especially if Andy Pafko had hit it. Most of Andy’s teammates didn’t hit a lot of home runs. One guy I remember well was Emil Verban, a reserve infielder who hit exactly one in his entire career. 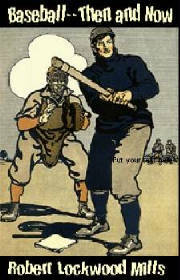 Many years after his retirement a fan group, the Emil Verban Society, emerged to honor Emil as a typical Cubbie for his lack of power and the team’s futility over the years. Verban wasn’t thrilled at first (a decent player, he had batted .412 in the 1944 World Series as a member of the Cardinals), but he later accepted the honor with grace. The Emil Verban Society doesn’t admit the public; its limited roster is made up of prominent politicians and media celebrities, all united in their love of the Cubs. Bobby Mills hasn’t been invited to join. The Cubs played only day games in the late ‘40s, and all their home games were televised. One memory I have is of how the TV camera would pick up the pitcher from the side as he delivered the ball, then flash to a side view of the batter, taken from the third-base area near the Cubs’ dugout. In the late ‘40s the Cubs hadn’t yet discovered the advantage of a camera view from behind the plate or from center field. So whenever the batter connected solidly, one had to wait until the camera found the ball somewhere in the outfield, by which time (if a Cub had hit it) the crowd was already roaring its approval. It was years later before I appreciated the serendipity of first discovering the joys of baseball in the same year that television came in. The fact that the Cubs were lousy, or that their TV coverage was limited technologically, didn’t matter then at all. Andy Pafko was enough for me. The Cubs were always lousy, but I was still on cloud nine as late as the 1950 baseball season, when Andy hit 36 homers and drove in 110 runs. I went to one game at Wrigley Field in 1950, courtesy of a friend’s father. The Cubs lost to the Dodgers, but what I remember most about the game is how many fans behind us in the stands were rooting for the Dodgers. It was unusual at Wrigley to hear fans cheering for the other side, so I turned around and stared at the disloyal rascals. They were all African-Americans (“Negroes” then), and what baseball was about for these fans in 1950 was Jackie Robinson and the color barrier. The Dodgers had four or five black players, and the Cubs had none that year. So the “colored folk” rooted for the Dodgers. After the 1950 season my world came crashing down. My parents informed me that we were moving back to Garden City, New York, my father having been transferred again by his employer, General Foods. We were an Eastern family originally (both my parents had been born and raised in Brooklyn), and they were thrilled to be “going home” to friends and loved ones they’d left behind in 1947 when we’d first moved to Winnetka…from Garden City, where my maternal grandparents lived and where my mother and I had been sheltered during World War II while Dad was fighting Germans overseas. “You are going,” my father replied. “You’ll do what you’re told,” my father answered. Dad was something of a martinet, and saw no reason to explain why we were moving. He didn’t brook dissent easily, and definitely belonged to the “Kids are seen and not heard” school of parenting. But he did encourage my interest in baseball, and tolerated the fact that I had become a Cub fan. Of course, having grown up in Brooklyn within walking distance of Ebbets Field, Dad was an ardent Dodger fan. Maybe “ardent” is too mild an adjective, because two weeks before I was born in 1941, Mickey Owen missed catching a third strike in the World Series, leading to a win for the Yankees, and causing my father such distress that he threw his radio down a flight of stairs, breaking it into pieces. My mother almost went into labor. Luckily I was born without complications…at least, none that were immediately detectable. Anyway, I lost the battle. I moved. Then things got worse for young Bobby Mills, who still hadn’t learned a thing about professional baseball and how it functions away from the green diamond and ivy-covered walls. One day in 1951 my father came home from work and told me the Cubs had traded Andy Pafko to the Dodgers. His Dodgers! I didn’t believe him at first, but then I turned on the radio and got the bad news. “They can’t do that!” I screamed. “No! No! No! It’s not fair,” I bellowed. “Well, he’s a good fielder,” I argued, summoning the courtroom passion of a Clarence Darrow and at once the righteous indignation of a William Jennings Bryan. My mother, the daughter of a lawyer, assumed I’d become one too, since I liked to argue so much that no other career seemed logical for her disputatious offspring. She might also have feared that nobody in business or industry would want me around the office for long. “Good fielders are a dime a dozen,” my father sneered. He liked to argue, too. “How can they do that?” I whined. I was prepared to hire my own lawyer to challenge the trade in court, but quickly realized I couldn’t afford one on my allowance of 25 cents a week. I argued vehemently that Pafko should have been given the choice of being traded or not. That’s not the way things were done back then, needless to say, but I will take credit for imagining a different future…today many players insist on and get no-trade clauses in their contracts. Naturally, the thought never dawned on Bobby that Andy Pafko might have wanted to be traded, in order to play in a World Series and make extra money. At age nine, I was still naïve enough to assume that ballplayers are as devoted to their teams as the fans are. Now that we were back in the New York area, we saw Dodger games on TV all the time. And while I hated to admit it, my dad wasn’t wrong. My hero Andy Pafko did seem to hit most of his home runs when it didn’t matter. It mattered to Dad, because the Dodgers were always fighting for the pennant in those years, and every game counted. Also, he had a bet with a Giant fan in his office on every game between the two teams. Then came the “shot heard ‘round the world.” Pafko and the Dodgers were cruising toward the 1951 pennant, leading the second-place Giants by 13-1/2 games in August, when everything went sour for Dad’s beloved Bums, yet again. The Giants rallied, tied the Dodgers on the final weekend, and won the playoff when Bobby Thomson hit the most famous home run in baseball history. Andy Pafko stood watching helplessly from the base of the left-field wall at the Polo Grounds as the ball soared over his head and into the grandstand. I watched that game with a schoolmate at his house in Garden City. Bob Colgan, a Dodger fan then, and I are still in touch after all these years; I’m not sure if he remembers that I was in his living room the day Thomson hit the home run off Ralph Branca. I was happy the Giants won, but out of deference to Bob I tried not to yell too loud. And, when my dad got home from work that night I avoided him like the plague. It wasn’t the time to ask for an increase in my allowance, or help with my homework. And it most certainly wasn’t the time to talk about baseball or defend Andy Pafko. I had grown up with the Cubbies. But in four years I’d come to learn that the game of baseball doesn’t remain in a boy’s conscious thoughts as he first had perceived it. He finds out about racism, sees players being traded away from their most loyal fans, learns about bitter hatreds between cities, and finds not all ballplayers are model citizens. Every young baseball fan experiences this loss of innocence at some point, but few ever forget their first glorious view of a major-league field or their first glimpse of a hero in the flesh.